Professor Rami Abboud has been invited to be a keynote speaker at the 63rd Annual National Conference of the Indian Orthopaedic Association (IOACON 2018) to be held at the CoDissia Trade Fair Complex, Coimbatore, Tamil Nadu 641062, India, between Nov 26th and Dec 1st 2018. Professor Abboud is Associate Dean for Learning and Teaching (School of Medicine), Head of the Department of Orthopaedic & Trauma Surgery and Director of MCh (Orth) at the University of Dundee, and will deliver two keynote lectures entitled “Clinical Gait Analysis” and “Foot and Ankle Biomechanics” on 1st December, 2018 at 8:00 am! 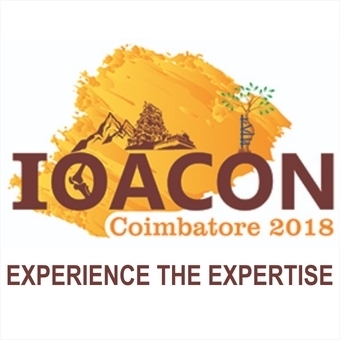 IOACON 2018 is jointly hosted by the three orthopaedic societies of Coimbatore, Erode and Dindigul, all from Kongu region which is well known for its traditional culture, friendship and hospitality. The theme of the conference has been carefully selected to be 'Experience the Expertise'. Many experts in various sub-specialties of orthopaedics from all over the world will be attending the meeting to share the wealth of their experience. Professor Abboud will be making the trip to India to represent the Department, the School of Medicine and the University and there will be a University manned information booth (Stall no. 135) at the conference giving information and advice about various courses and life as a student in Dundee. This has proved to be a highly successful exercise over the past several years with great interest shown by delegates who this year are expected to number close to 10,000 eminent orthopaedic surgeons of national and international repute, sharing their views and their work and experiences, during scientific sessions, workshops and CME. Apart from the honour of once again presenting at IOACON, Professor Abboud will be hosting a Celebratory Dinner marking a quarter century of the MCh (Orth) at the University of Dundee. The dinner will be held on Nov 28th at 7:00pm at the Hotel Le Meridian, Coimbatore. Accompanying Professor Abboud for the trip will be a few familiar faces from Dundee; Dr Graham Arnold, Mr Sadiq Nasir and Mrs Sheila MacDonald. This celebration is to complement a Dinner & Ceilidh that was held for the 25th Anniversary of the MCh (Orth) degree on Saturday 2 June 2018 in the ballroom of the Invercarse Hotel, Dundee. Each Alumni attendee will receive a specially designed and struck nickel-silver pin badge as a memento of the occasion along with a specially designed tie and a commemorative desk trophy. If you would like to attend the Dinner please email Mr Sadiq Nasir.